The Nooteboom Manoovr generation has set new standards for the transport of heavy machinery. 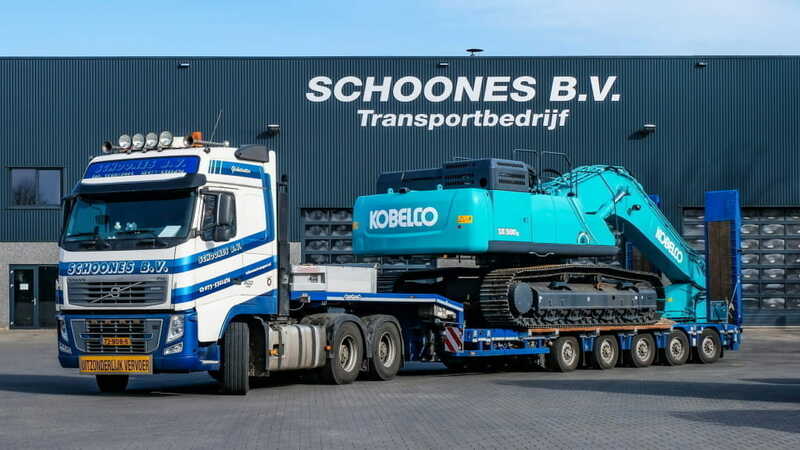 The latest additions here are the 4-axle, 5-axle and 6-axle extendible Manoovr semi low-loaders with excavator trough, especially for the transport of e.g. earthmoving and construction machines. Nooteboom has developed special ‘Heavy Duty’ ramps to load these machines, weighing up to 80 tonnes, onto the load floor. Each of these ramps separately can take a wheel load of 20 tonnes. The technical axle load of a 6-axle extendible Manoovr semi low-loader, type MPL-97-06(VU), is 75.5 tonnes. With these latest ramps the load capacity can be used to the full. Due to the clever design and shape of the ends of the ramps there is a slope of just 10 degrees, which makes it much easier to drive the load on and off the trailer. The maximum permissible weight of the 6-axle extendible Manoovr semi low-loader with excavator trough differs per country. 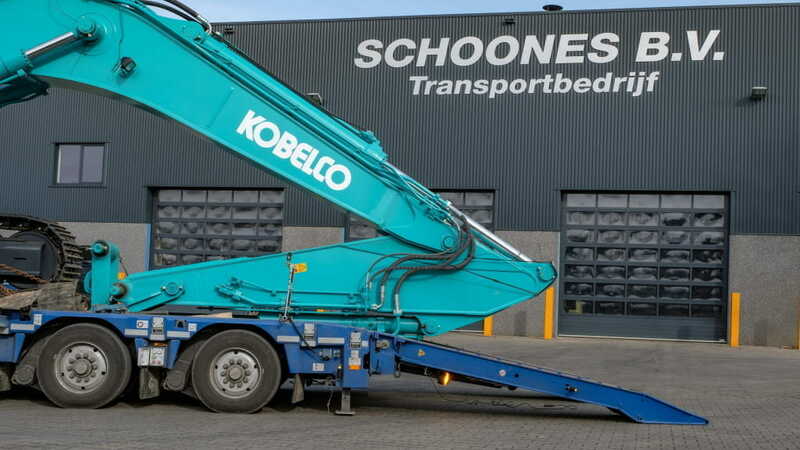 In the Netherlands the rated load capacity is 75.5 tonnes at 80 km/h. In Germany, with a § 70 StVZO exemption, this is two tonnes less due to the restriction of 35 tonnes for a 4-axle tractor in Germany, resulting in a fifth wheel load of only 23 tonnes instead of 25 tonnes. With a Category 3 exemption this is 75.5 tonnes in France, the same as in the Netherlands. To make it possible to load these machines that can weigh up to 80 tonnes safely and efficiently onto the Manoovr semi low-loader, Nooteboom has developed these Heavy Duty ramps and has also made the rear of the Manoovr extra strong. On the left and right-hand side of the excavator trough the floor can be loaded with 30 tonnes – 60 tonnes in total. This on a surface of just 30 x 30 centimetres! Heavy Duty hydraulic landing legs can be mounted underneath the rear of the trailer. These also have a bearing capacity of 30 tonnes each, so 60 tonnes in total. Here are a few examples of types of machines from the extensive Caterpillar range that can be transported easily with the Manoovr semi low-loader with excavator trough. Take the 336F, 352F and the heavy 374F. Until a few years ago the 39-tonne 336F was a standard load for a semi low-loader. This machine is 3.16m high – up to the roof of the cab. The total height was less than 4.20 metres. With a weight of 51 tonnes the 352F is quite a bit heavier. Because this type is 3.37m high -up to the roof of the cab – it is not possible to keep within the 4.25 height limit if an older type of semi low-loader is used. Due to the low load floor the Manoovr semi low-loader can transport this Caterpillar with ease. Even with the widest tracks this machine will stay below 3.50 metres. Perfect for a ‘normal’ 100-tonne annual exemption. But a Manoovr can even carry machines that are much heavier than that. The Caterpillar 374F is a mighty machine that weighs 73 tonnes. 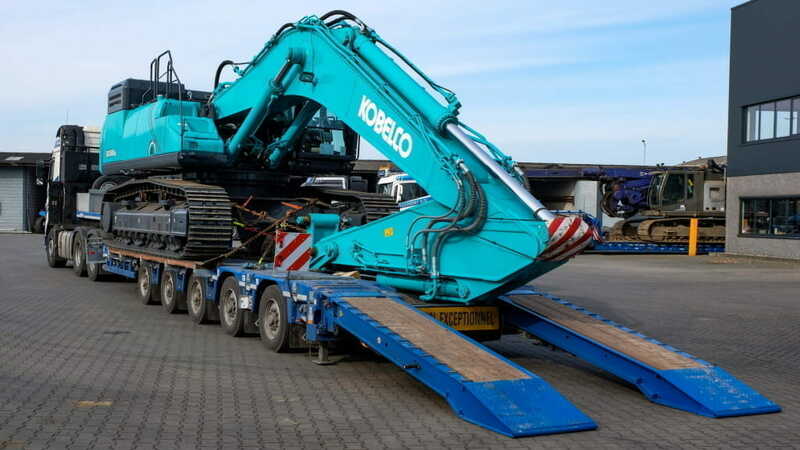 Thanks to the wide excavator trough the 6-axle Manoovr can also load this machine and transport it, while previously a 4-axle pendle axle low-loader and 2-axle were needed. This shows how much progress has been made. Innovation is often found in small changes. The new ramps, the extra-strong rear of the load floor and the hydraulic Heavy Duty landing legs: they make the Manoovr with excavator trough the new benchmark in this category. The new ramps are available for the 4-axle, 5-axle and 6-axle Manoovr with an excavator trough. The load floor of the Manoovr is stronger than the floor of any other semi low-. The extendible main beam of the Manoovr is calculated per vehicle for the maximum load capacity. The platform of the Manoovr can take extremely heavy loads and the rear of the trailer can on each side be driven over or loaded with a load of up to 30 tonnes. The coloured fields in the drawing above, taken from the Manoovr manual, show the driver exactly what the permissible load is in the various areas.